The United Arab Emirates is a land of contrast, balancing prosperity on one hand and sustainability challenges on the other. 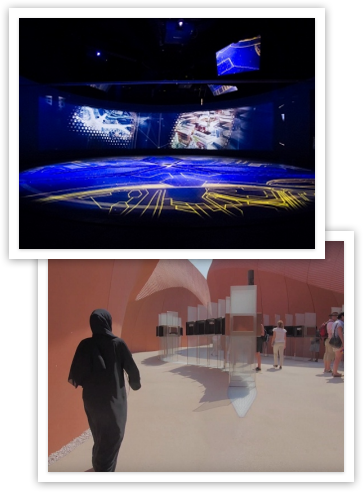 It is these themes that the Emirate explores at Milan Expo as visitors are invited on a journey to discover both the history and the future of the desert state. Their temporary home is a masterpiece jointly designed by Foster Partners and the UAE, where visitors are drawn into the mouth of a canyon-like space, defined by two undulating 12m high walls. Influenced by ancient planning principles, the paths through the pavilion are suggestive of the narrow pedestrian streets and courtyards of the ancient desert city. If the exterior of the building is inspired by ancient times, inside is quite the opposite. A ramp leads gently upwards from the entrance towards the auditorium. Augmented reality devices help to bring the story of the Emirates to life along the route. The state of the art auditorium is contained within a drum at the heart of the site. Audiovisual partners Sysco Productions have created an entertaining space, using the latest technology to create a show that is wowing visitors and means queues that, most days, surround the building. 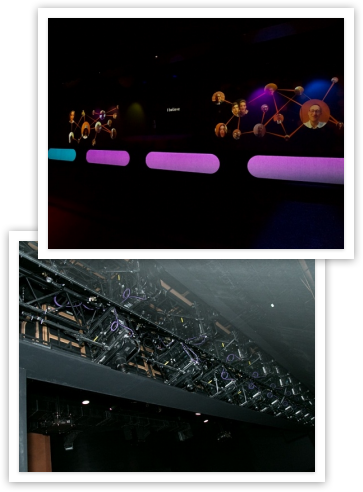 130 guests at a time are ushered in to the cylindrical auditorium to watch a creative multi-projection multi-channel audio production, which uses five Panasonic PT-DZ21K projectors. This amazing 170-degree theatre show introduces the audience to Sara, a girl growing up in Dubai, telling the story of a country growing rapidly and facing up to the challenge of feeding and powering an ever growing population. The guests are then fed in to a second auditorium, where a giant Pepper’s Ghost installation, creates a 3D Sara, who continues the story mixing video and actual props. So, for instance, she takes a video lid from an actual pot, from which video steam escapes. “We use 10 projectors which are projecting straight down on to a white projection screen on the floor. What the audience is looking at is a 45 degree musion foil, which is like a half mirror. It means that the light from the floor can be see floating in mid air, but also anything lit behind the screen can still be seen by the audience,” said Chris Dunkin of Sysco Productions. The installation is 23 metres long and four metres high and uses 17 PT-DZ21K Panasonic projectors in total. As part of the second act, visitors are turned from ‘watcher’ to ‘watched’. Video of visitors singing along to a rap, filmed by staff using a customised app, is fed into an After Effects server and rendered out to play back as part of the ‘Future Talk’ showpiece. Panasonic PT-DZ21K 20,000 lumen projectors are used to deliver audience faces, with perfect clarity and contrast and to either side of the exhibition space to complete an immersive experience. After the screening, visitors follow a path through further interactive displays and digital talks, including a special exhibit celebrating Dubai as host city for the 2020 Expo. The set-up involves 11 Projectors, five equipped with ultra-short throw lenses, to blend and map content on to a circular screen floor. Concentric shapes are lifted out of the floor hydraulically, an effect which makes the digital mapping all the more impressive. Delays to the building works meant the installation programme was severely compressed. Sysco had to work around the clock to ensure the project was ready in time. “We were delighted to be working with the Panasonic projectors. They were installed on what was still a building site and were subjected to a leaky roof and a very dusty environment, without any problems. Having the four lamp system has meant we can rely on the projection at all times, essential when there is a matter of minutes between each show,” added Mark Burgin.